On May 21, 1927 a tall lanky Minnesota farm boy landed an odd single-engine plane with cloth-doped wings, and a periscope (massive fuel tanks obstructed the forward view) at Le Bourget Field in France, completing the first, non-stop, 3610 mile, transatlantic flight from New York to Paris in 33.5 hours. The achievement garnered the $25,000 Orteig Prize and catapulted Charles Augustus Lindbergh (1902-1974) to international acclaim, while the Spirit of St. Louis became the most renowned plane in aviation history. Courageous hero, pioneering aviator, explorer, and Pulitzer Prize-winning author (as well as an anti-Semite and philanderer), Lindbergh was above all else a complex and obdurate individualist. Sadly, his success led to tragedy (the kidnapping and murder of his son, Charles A. Jr.) and ultimately vilification by the Roosevelt administration for his outspoken non-interventionist stance prior to WW II (he subsequently flew 50 combat missions in the Pacific during the war). The Spirit of St. Louis in flight. The original Spirit of St. Louis, named for Lindbergh’s financial backers and officially known as the Ryan NYP, hangs from the ceiling in the Smithsonian National Air and Space Museum in Washington, DC. Specifically designed for its historical transatlantic flight, the modified Ryan M-2 strut-braced monoplane with a 46’ wingspan was built in two months by the small Diego firm of Ryan Airlines Corporation. The Spirit was powered by a 223-hp air-cooled, 9-cylinder, Wright J-5C “Whirlwind” engine fueled by five massive fuel tanks totaling 450 gallons, which when filled brought its total weight to 5,135 lbs. 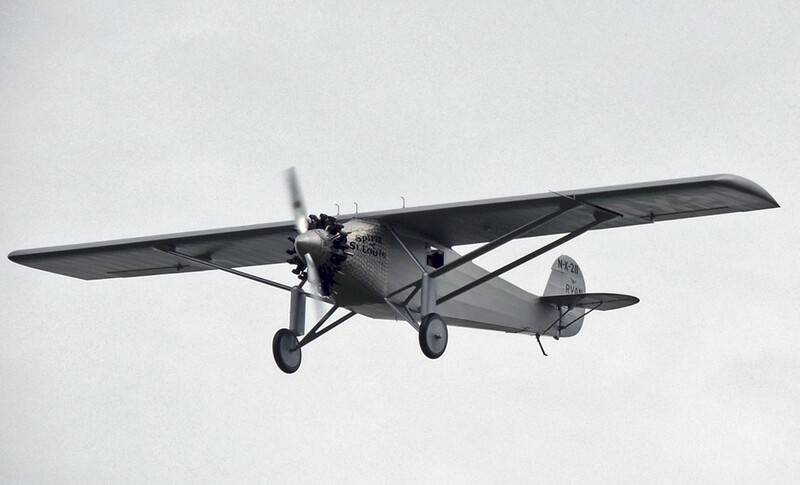 Today the Spirit lives on in a recently completed exact replica (which involved several visits to the Smithsonian) built over a twenty year period at the Old Rhinebeck Aerodrome. Long the dream of founder Cole Palen, who obtained an old restored Wright J-5 Whirlwind engine in the 1970’s, the plane was completed by vintage maintenance manager and pilot, Ken Cassens. On May 21, 2016, the 89th anniversary of Lindbergh’s original flight, the new Spirit of St. Louis soared above the aerodrome to the delight of several hundred aviation enthusiasts, many of whom were attired in 1920’s apparel. For more information and to “catch the spirit” at future events visit oldrhinebeck.org.